Lunch with the Bridge Project … and its great to be able to spell! Its probably a sign of age, but, given that I feel I hav e some grasp of grammar and spelling, I get a bit irritated at spelling and grammatical errors. Now, it was really nice of the City Council to react so very quickly to my request for signs at Pinegrove, but the one at ShepHerd’s Loan looks a little sad … see above right. Anyway, I’ve reported it and I dare say we’ll get a replacement soon. I have promised Rev Andrew Greaves of Dundee West Church for ages that I’ll have lunch at the Bridge Project one Friday and Janet & I made it today. Super lunch and really friendly welcome! That’s me (below) finishing off my soup. You can read more about the project by clicking the headline above but in short, the project in has been running a Food Co-operative since September 2004, with support from the Scottish Countryside Alliance Educational Trust. 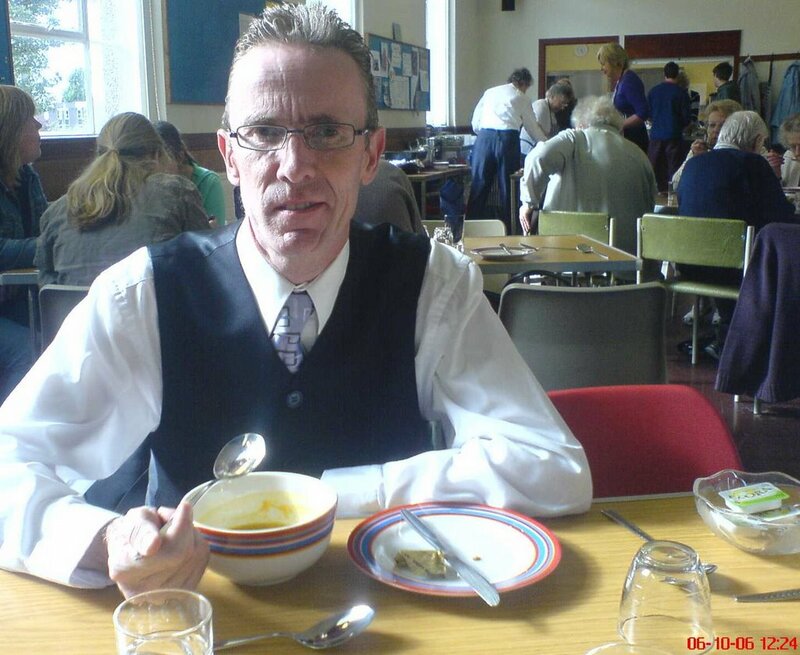 Its a brilliant project, attracting lots of local people of all ages to Dundee West Church every Friday – to enjoy a great value, nutritious lunch. Was good to chat with many West End residents too! Oh, and really positive news on the West End Christmas Week – with great support from the shops and other businesses relative to the fireworks display – a great Christmas Week for the West End lies ahead!